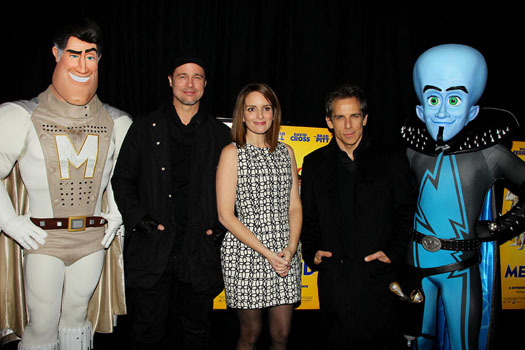 NEW YORK, Nov 3, 2010 / FW/ — Tonight at the AMC Lincoln Square Theater in New York City, actors Brad Pitt, Tina Fey and Ben Stiller attended the premiere of “Megamind” together with the “Megamind” and the “Metro Man” mascots. Estimated to cost $160 million to produce, the animated comedy film will open in U.S. theaters on November 5, 2010 in Digital 3D, IMAX 3D and 2D. “Megamind” revolves around two super hero types – Megamind (Will Ferrell) and his life-long archenemy Metro Man (Brad Pitt). But while Brad Pitt’s Metro Man is a popular celebrity like a normal super hero, Will Ferrell’s Megamind is a belittled outcast due to his unintentionally disastrous intellect. And that is where the fun begins! The film features the voices of Will Ferrell, Tina Fey, Jonah Hill, David Cross and Brad Pitt.